This article was originally published in March 2017. The article was updated to reflect new information available on chatbots in December 2018. Recently I awoke to an intense, pulsing pain in my lower abdomen. A few years ago, I would have had two options — go to the emergency room or an urgent care facility. Both are pricey. This time, I sought help from the telemedicine service covered by my health insurance plan, where I was able to call in and speak with a medical practitioner. They confirmed that I likely had a kidney stone and helped me understand the next steps to treatment. It was a great service, but I had to wait about two hours for the call back from the medical practitioner… and that is a long wait when you’re in pain. We’ll get to how build a Facebook chatbot in a bit, but first… Think about how your chatbot could help people. What if I could have gone online and chatted with a doctor in minutes instead of hours? 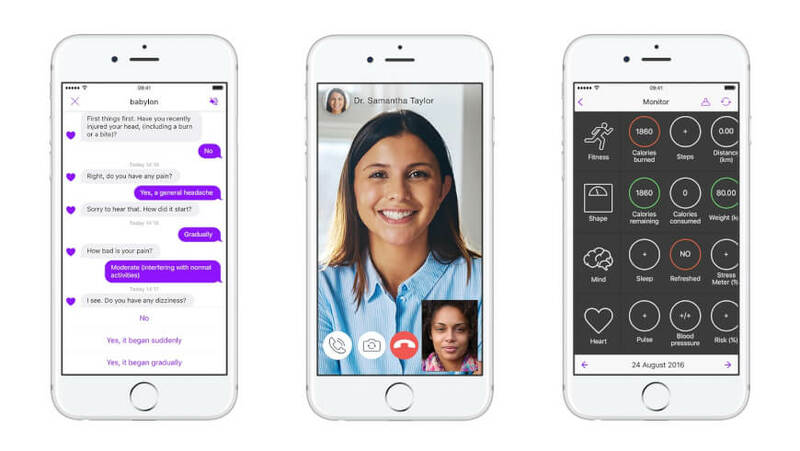 It turns out a number of medical chatbot applications are available — you install one on your phone, and you can get self-help diagnostic information for your ailments. It uses artificial intelligence to enable you to hold a conversation with a chatbot and get conversational answers to your medical questions. It can even connect you with healthcare providers in real-time. Just one of many examples of these medical diagnostic chatbots is Babylon, a subscription service available in the UK that offers artificially intelligent chatbot-based consultations that result in a suggestion for a medical course of action. How are companies using chatbots in marketing? Dozens of large marketing-heavy institutions, including Disney, Uber, and Kayak, are using chatbots to connect with their customers and sell more products and services. 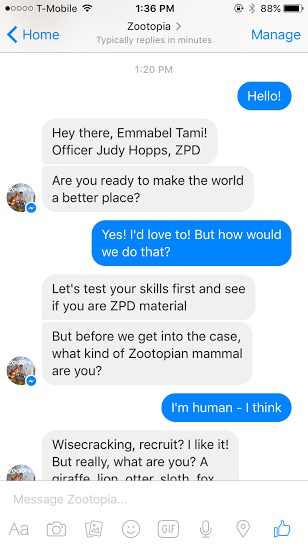 Disney, the enormous media and entertainment conglomerate, helped promote their ‘Zootopia’ movie, with a Facebook Messenger chatbot that interacted with children. The chatbot led the child through a conversation with the movie’s main character, Officer Judy Hopps, as they worked together to catch bad guys. Kayak, one of the most popular air and hotel booking platforms, allows you to interact with its chatbots via Facebook Messenger, Slack or Amazon Alexa. Kayak’s main website provides tools for searching airlines and hotels and then booking them directly. With their chatbots, they are taking their service even further: You can receive budget-driven recommendations, get updates on your already-planned trips, or evaluate the best time to travel to certain hotspots. Chatbots are meant to be more interactive ways to communicate with potential customers, not merely a way to help close a sale. As such, Kayak has introduced more conversational functionality beyond simply booking travel. Likewise, chatbots can be leveraged in more creative fashions to generate leads. Traditional lead generation for both B2C and B2B marketing involves a lot of advertising and calls-to-action, such as “download this ebook,” to capture the lead for a sales follow-up. 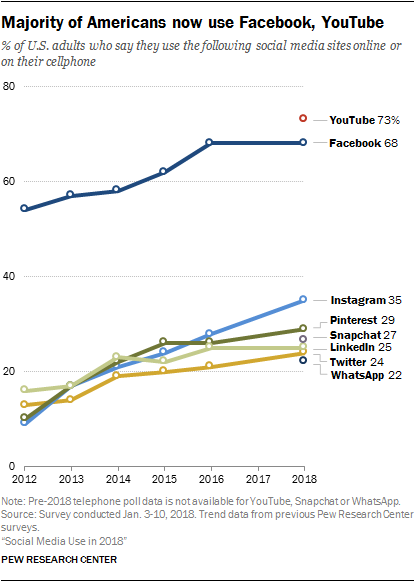 With 68 percent of online adults in the United States on Facebook, according to Pew Research, you have a strong probability that you can get your chatbot in front of your target demographic if you create a chatbot for Facebook. While Facebook Messenger is the leading platform for chatbots, other platforms also slowly opening up. You can build chatbots for Twitter, and several communication platforms such as Slack, Skype, and Kik. Any product or service that has a high level of pre-purchase decision making, such as auto sales, real estate or enterprise software, can gain immense value from a chatbot. Because your prospective customer is likely doing a fair amount of online research into which product to buy, it makes sense to build a chatbot that helps answer questions for them, in a smart and conversational way. Somewhere in the conversation your chatbot can offer a downloadable guide — all the prospective customer needs to do is provide some contact information, and the guide will be sent to them. Assuming your chatbot provides value to the consumer when your salesperson reaches out to discuss the sale, they will have already had a favorable interaction with your brand. Even though Facebook has been heavily pushing chatbots on it’s Facebook Messenger platform for almost three years now, adoption has been slow due to the relative complexity of building a chatbot. As you’ll see in this article, though, building a chatbot does not need to be an onerous experience. Despite chatbots having been around for some time now, lead generation via chatbots is still a very new technique. Not many people are leveraging them, and so there is still very much an early adopter advantage that you can get from launching a chatbot for lead generation. To help you get a better idea of how you can leverage chatbots for lead generation, I’ve made a list of chatbots I’ve either built for clients or that I’ve dreamed up and intend to build. Why am I not worried about sharing these with you? Because I honestly feel that with time, all of these ideas will be on the market, and there is no reason to hold your cards close to your chest in this game… still plenty of lands to be claimed. Of all the hungry professionals out there, real estate agents rank among some of the most lead-hungry. It is amazing what real estate agents will pay for a strong lead. I know, because I am a real estate agent (just for my own personal purchases… not actively practicing). I’ve built a bot for a client that helps potential home-sellers evaluate if they could sell their home on there own, or if they need help from a real estate agent. I’ve done several bot-building trainings with this real estate agent bot example. If you’re interested in seeing more on this, be sure to read through to the end of this article, where I share an actual template you can copy and use yourself for your own clients. Financial institutions that provide consumers or businesses with loans are always looking for ways to get more applications. Why not offer a loan calculator? After running the calculation in the chatbot, open up a dialog and offer something free (perhaps a guide on the “ten things to ask a lender”) in exchange for their email address. Just as the new year brings new resolutions, it often encourages people to try a little harder at controlling their tempers, better managing their budgets, or improving their life by other means. In steps a bot that gives some free advice in these areas and then puts the consumer in touch with a life coach. Several of my state-level politicians have started to reach out to me, as their constituent, to keep in touch via YouTube and/or email updates on what they are doing in the state legislature. They have my contact details because I’ve participated in the democratic process and given them my contact details. What about the thousands of other constituents in their district that they can’t reach? In steps a bot that updates their voters in real-time, via Facebook Messenger. And the great thing about Facebook is that it allows you to draw tight geographic fences around areas you want to advertise in. A politician can sets target around her district, buy ads, get people into her chatbot… and now has a more pro-active voice with her constituents (and a much greater likelihood of being re-elected). The financial planning industry is very competitive for new business. Advertise a guide on Facebook that is sure to whet the whistle for would-be investors and then take them into the chatbot when the click the ad. From there, capture their email address, and you’re gold! No matter the home service you offer (or that your client offers), you can help automate quotes and lead generation for potential new customers. You can also provide home improvement advice through a chatbot as a method of greatly increasing the likelihood that you’ll garner new leads. If you are involved in an appointment heavy industry (hair salons, dental offices, etc. ), then you can leverage a chatbot as a method for current customers to book spots on your calendar. Simply opening up a dialog with your customers, via Facebook Messenger, will allow you to proactively reach out to them to see how they are doing, to solicit reviews/feedback, and to run “refer a friend” promotions. When I first looked into chatbots a few years ago, the chatbot-builder solutions required some coding knowledge, and you had to work directly with Facebook’s developer console to build a chatbot. Thankfully, that is no longer the case. There are dozens of chatbot-building solutions out there, with three of the most popular for Facebook Messenger chatbots being Chatfuel, ManyChat, and Dialogflow (formerly called API.ai). Each of these solutions provides point-and-click, no-coding-necessary options for creating an interactive chatbot on the Facebook Messenger platform. Chatfuel is super easy to get rolling with and does have a fairly robust feature set. I recommend it for beginners and small businesses who need an MVP (minimum viable product) they can try out quickly. For the DIY guide below, we will be using Chatfuel. ManyChat is also easy to use, though it has a little more functionality than Chatfuel. That said, because ManyChat is more powerful it has a little higher learning curve. At a recent social media marketing conference I had the opportunity to see employees of both ManyChat and Facebook, and it appeared that the two companies work closely at ensuring features are quickly forthcoming, and that the ManyChat platform benefits from the creative process behind employees at Facebook. Dialogflow is a more robust solution, though it is still simple and requires no coding. I recommend it for organizations that have more resources and are looking for a more powerful chatbot that can interface with their ecommerce solution or other enterprise-level tools. How much do these tools cost? Each is free, up to a limit. Chatfuel says if you’re going to have more than 500,000 active monthly users, you need to sign up for a premium account. ManyChat’s free version limits you in the scope of chatbot dialog programs you can build. Dialogflow doesn’t specify what their limit is, which means they’ll likely add in features in the future that you’ll need to pay for. As of now, though, each of these systems is more than generous in their free plans. Now that you have a good understanding of what a chatbot is, how it can be used in lead generation, and the two leading platforms for building code-free chatbots, let’s jump into actually building one. Creating a chatbot is such a simple process that it can be done by anyone with at least some technical prowess and about 10 minutes to spare. Note: My “build it in about 10 minutes” claim is not promising a chatbot that will wow your potential customers. But, it will be enough time to build and launch a very basic chatbot. To build a feature-full chatbot with some immersive artificial intelligence that can carry on strong conversations, that will require some considerable time and effort on your part. This time isn’t spent actually building the tool, but you will be spending considerable time writing content, forecasting what the most frequently asked questions are going to be, etc. Step 1: Connect your Facebook account to the Chatfuel chatbot builder. This step is super easy. Make sure you’re logged into Facebook on the browser you’re going to connect to Chatfuel in. Then simply click the “get started for free” button on the Chatfuel homepage. It will bring up a Facebook connection page that allows you to give permissions to Chatfuel to see your Facebook information. You need to authorize it, and you’ll then be taken back into the Chatfuel chatbot builder, where you’ll select which Facebook page you want to connect to. Step 2: Connect to your Facebook business page. Because chatbots are tied to organizations and not to individuals, you need to have an organization Facebook page that you use to tie your Chatbot to. If you don’t already have a Facebook page for the business you’re going to do marketing for, you should create one. Here’s a quick guide from Hootsuite to help you get started building a Facebook business page. Alternatively, you can also click the “Create a Facebook page” button in the Chatfuel interface to set up your page at this step. However, setting up a Facebook page is very important, and you need to make sure you do it the right way, so I recommend going into Facebook to do it and using the above-linked guide. Then come back to Chatfuel. Once you have a Facebook page, simply select it and you’re on your way. Step 3: Walk through the in-app tutorial. Now that you’ve connected your page, you’ll be taken into the actual chatbot builder. Chatfuel has a fairly detailed tutorial you can follow, though it’s not as good as this guide. It does give you a good overview of the chatbot components and how to get started with their user interface. I do recommend you taking two or three minutes to click through their tutorial, as the background knowledge will help you on your way. Step 4: Create your welcome message and default answer. After the brief tutorial, the next step is to create your welcome message. The first interaction your chatbot visitors will have is with this message, so make it good. Make sure to also create a default message — something that’s shown in case the user types in a message which you don’t have AI detection set up for. It should say something along the lines of, “I’m not sure what you’re asking. Maybe some of the options below can help you.” Be sure to link your default message to your navigation items (discussed in the next step). From this point you have two options: You can have a navigation-type driven conversation (like a phone menu system), or you can have artificial intelligence set up to guide the conversation. The latter is entirely possible with Chatfuel but requires considerable content development on your part. We’ll show you how you can set up AI conversations, but this DIY guide will focus on getting an MVP version of a chatbot launched using navigation buttons and prompts. Be honest with your audience. I’ve always been a proponent, in bot building, of having your bot admit upfront that it actually is a bot. Most chatbot builders have followed the same guideline. Up until recently, the reason for having your bot admit that it was a bot was because our consumers expect (and should be given) transparent interactions with our companies. It just seemed like the right thing to do. Recently though, it has become a law in California that your bot admits it’s true identity upfront… and assuming you’re not going to somehow block your bot from working in California, you’ll need to comply. Step 5: Set up your conversation navigation. In this step, you will build your conversation navigation, i.e., the means for an individual to work with your chatbot. 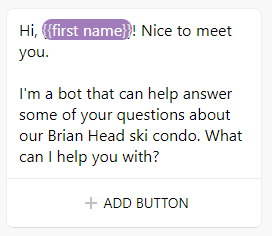 In the example chatbot we’re building, we are trying to help our audience find answers to questions they might have about booking a Brian Head, Utah, ski condo. Where is the ski condo? Do I have to drive from the condo to the resort? What are check-in and check-out hours? How many people does the condo sleep? To set up the actual navigation, you should build a new “block” for each of these questions. It’s really easy; just click “add block,” and then type in a title for the block. Don’t worry about putting content in yet. Just create the blocks and title them. Step 6: Link the blocks to the main navigation. Go back to your main welcome message, and click the “add button” option on the message block. Type in the button name — what you want the user to see — in the first field. Then, in the next section, select “block,” and then you can select the block you’d like it to take the user to. URL. Put in any URL you would like, and it will take the chatbot user outside of Facebook Messenger to that page. This can be good if you have an external booking or reservation system you would like to direct the visitor to when they ask a question about how to make a reservation. Phone call. Enter a phone number, and the user clicking that button will launch the phone’s dialer and pre-populate a phone number. For this example, we’ll simply select block, and link to one of the blocks we’ve already set up. Note: A chatbot works best when it’s conversational. So don’t have your chatbot present users with a long list of options. You want to have just a few top questions, and then have the rest of the logic built into the AI. Chatfuel forces this best practice by only allowing you to have three “buttons” on any given block. ManyChat and most other bot builders follow this same limitation – giving you only three buttons per block. For this example, we’re putting in just the top three most frequently asked questions, and then will build in the AI for other questions. Step 7: Put in your chatbot dialog. Text card. This is Chatfuel’s most simple block type. You simply put text into this block. For simple answers, this is a great option. Typing. This simulates an actual human typing in the response. If you’ve used Facebook Messenger to chat with another human you’ve likely seen the little three dots at the bottom left of the window as someone is composing a message to you. You can recreate this effect in your bot, with this “typing” option. Even though it is important to disclose to your users that your bot is indeed a bot, you may still want to use this typing delay to make the conversation seem more realistic. Quick reply. If you build this option into a block, instead of taking them to a new card for an answer, it simply shows a reply. In this way, it behaves more like a chat thread you would be having with a real person. Image. This is another simple block type. With the image block, you upload an image and when triggered in conversation, it simply shows that image. Gallery. This is your best bet if you want to add a few pictures to an answer. In this example, if someone asks, “Can I see some pictures?”, we’re assuming they want to see pictures of the ski condo. We would use this gallery and put in a few pictures, a heading that describes what the picture is, and then a subtitle or description. You can also add a URL for each image. You can get really creative with these and use them similar to Facebook’s Carousel Format ads. Go to Block. Selecting this option allows you to send your chatbot user on to another specific block, or small component of a conversational dialog. To Sequence. Similar to the “go to block” functionality, this allows you to redirect a user to a completely new conversational sequence. A sequence usually contains many blocks. +. This “+” sign takes you to a menu of numerous plugins that enable you to integrate your chatbot with other third party apps or leverage more powerful options inside of Chatfuel. This is one area where Dialogflow is more powerful; Dialogflow has a lot more integration options than with Chatfuel. That said, Chatfuel does have some excellent integrations and will fulfill most chatbot builders’ needs. 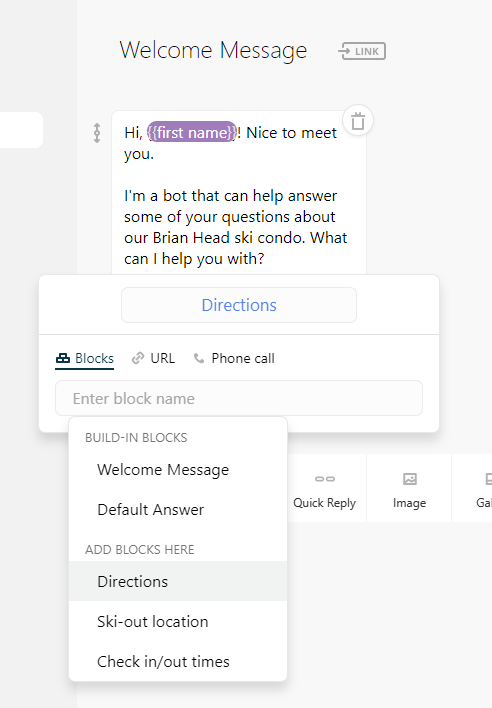 For example, in the case of a ski condo, you could integrate your chatbot with IFTTT so that when someone asks, “How much snow is there at Brian Head?” the chatbot will talk to IFTTT, which will, in turn, contact your Instagram feed and pull in the latest image you have tagged with #brianheadsnowconditions and the chatbot will then display that image. Sweet, huh!? Go ahead and use a simple text card to create an answer for each question/answer segment you want the chatbot to support. Step 8: Create your artificial intelligence. After you’ve built out all your content blocks, go ahead and click on the “Set up AI” link in the left-side navigation. Here you get to brainstorm all the questions that might be asked of your chatbot and set up answers. The answers can either be new text you enter in this stage, or you can direct them to one of the blocks of content you’ve previously set up. Phrases to watch for. This is where you put in the different words or phrases you want the chatbot to watch for. 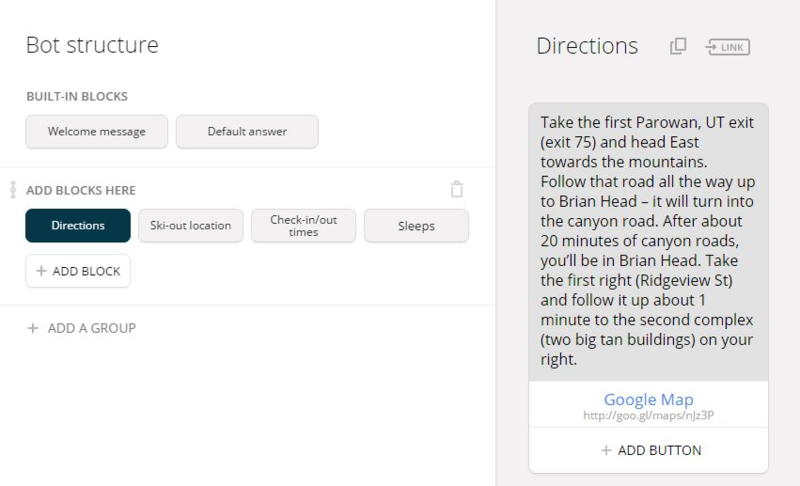 For example, in the above example, if a user types in a question or phrase with “directions” in it, the chat bot can return actual directions. Content to display. After the chatbot detects a word or phrase in the conversation, it will return the content you’ve specified. There is a little drop-down where you can select “text” or “block.” If you select text, it will allow you to enter a new text response. If you select block, you can choose the block you want to display and the chatbot will show that content instead. Chatfuel excels at launching your chatbot. In fact, it is already ready to go — as you build your chatbot, Chatfuel is saving and making all your changes live, immediately. This’s nice because there’s nothing you need to do to launch your chatbot, other than getting the link and putting it on your website, Facebook page, or in your online ads. All you have to do is click on the “Promote” page in the left-hand navigation menu, and then copy the URL at the top of the page. What other bot-building tools are there? Just a year ago, I could count the bot building tools on two hands and two feet. As the marketing potential for bots has proliferated, so too has the number of bot building tools. This bot-builder, as I’ve outlined in the rest of this article, is what I consider to be one of the easiest bot-builders around. That said, Chatfuel still has some robust functionality and would be a good fit for most use cases. It even has native payment processing built in (so chatbot users can buy stuff directly from your bot), a feature that ManyChat and FlowXO still lack. Please note that the example above has an option that allows you to use my simple design as a template in your own bot. Feel free to copy and use on your own projects! FlowXO began life as an integration platform between chatbots and other tools. It was like the Zapier of chatbots. However, they quickly realized that if they built a chatbot building platform they could gather even greater market share, and so they did. If you need heavy integrations with other third-party tools (Salesforce, Marketo, Google Sheets… practically anything) then I recommend FlowXO. It isn’t nearly as graceful to use as ManyChat or Chatfuel, though. Originally called API.ai, DialogFlow is a powerful bot-builder maintained by Google. With DialogFlow you have the most functionality of any bot-builders out there, but leveraging the advanced functionality often requires the help of a developer. 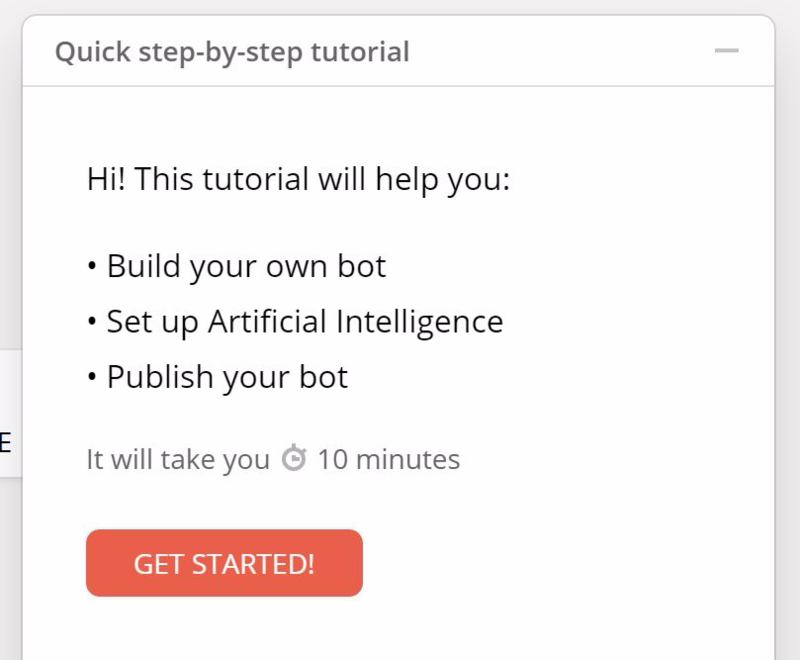 With FlowXO, ManyChat, and Chatfuel you can build your own bot with no programming expertise. Microsoft has some of the most powerful natural language processing available and allows chatbot builders to leverage their system through the Bot Framework. So, if you’re looking to have a human sounding bot, this chatbot-builder platform may be right for you. Something to keep in mind, though: You’ll need a true developer (or a dozen) to build a bot on the Bot Framework. I’ve started to see new chatbot builders enter the industry that have niche offerings. Instead of being able to build full-feature bots, they are providing a platform to do a smaller niche process, and do it exceptionally well. MobileMonkey specifically fills a niche need of getting live-chat experiences on to websites, which remember previous conversations to build upon those for future interactions. While Facebook is just starting to make on-site conversations possible for those building Facebook Messenger bots, MobileMonkey has had these on-site interactions since inception. They also boast the ability to remember conversations, between conversations, in order to improve the continuity of user experience. 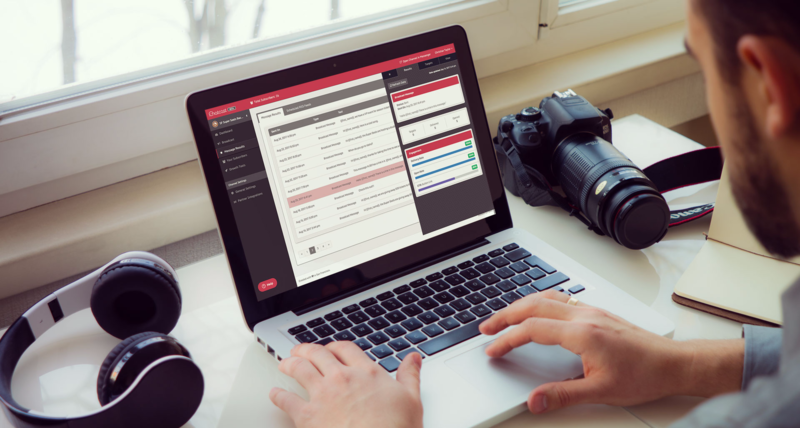 While most chatbot-builder platforms pride themselves on being jacks-of-all-trades, ChatCast is primarily focused on helping brands get their messages broadcast out to their database. It heavily leverages Facebook Messenger and SMS to get these messages out, but has built a platform that is more focused on broadcasting the message. This is very good for brands looking to get in touch with large swaths of their audience at the same time. I also expect to see great things from ChatCast, as it’s founder, Scott Edmonds, was one of the early executives that made Marketo into a leading marketing automation platform.